As you all know, our dear boss Nancy is away on the trip of her dreams in England with many friends and gardeners. She has smartly unplugged from work and we await the stories and photos upon her return. In the meantime we here at Natureworks confidently hold down the fort and keep the magic alive! This week we are CRAZY for Coneflowers! 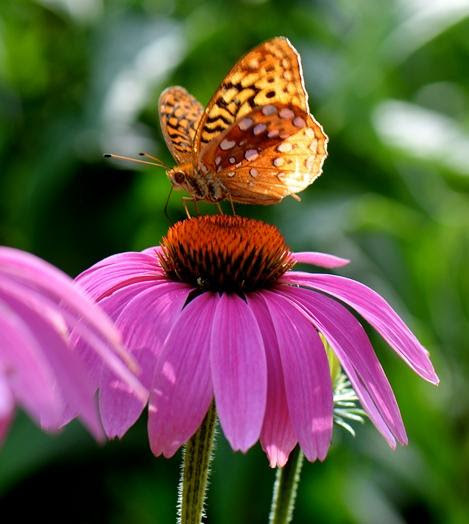 We have Echinacea/coneflowers of every shape and color. We have pink, purple, yellow, red, orange and a mix of colors too. We have tall ones, short ones and sizes in between. Why do we like these so much? They are the classic July flower. They start blooming in early July and continue on through the summer. They make a great cut flower. The bees and butterflies LOVE them. And if you keep the seed heads on, you will see birds eating the seeds in winter. 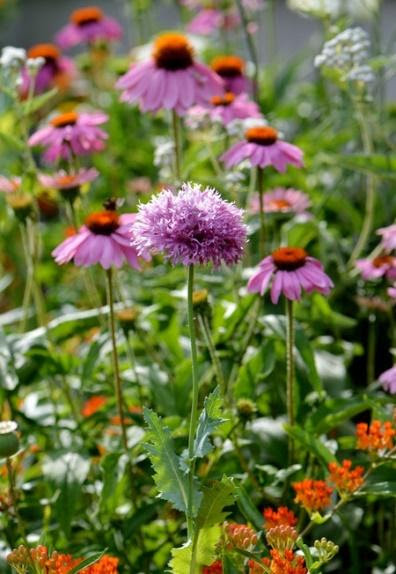 Echinacea likes full sun in a well drained soil. Plant them where it is well drained in winter too-they do not want to be under the pile of snow shoveled from the driveway. And fertilizer? Nope-they don’t want it! If Echinaceas are fertilized, they grow too tall and flop over and need to be staked. They are wonderful and add so much to the summer garden. This week we continue to welcome deliveries of fresh plant material. As I am typing, the retail staff is actually unloading a truck. They just unloaded a big block of blooming Phlox and an Astilbe to swoon over named ‘Chocolate Shogun.’ This Astilbe has incredible dark chocolate-purple lacy foliage. It blooms a very light pink in summer to about 2 feet tall. It prefers light shade but can tolerate sun as long as soil is kept reasonably moist. Another beautiful plant this week is Cephalanthus occidentalis or buttonbush. It is a native shrub blooming in our display garden now. It CAN mature to 8-10′ tall in moist areas. In our gardens, it stays 4-5′ tall and is in a well-drained, not very often watered, fend for yourself plant-type of soil. Buttonbush is great for wetland projects and its extensive root system makes it a good choice for preventing soil erosion. The flowers are really cool orbs and are full of pollen. Look for it on the sides of the roads-there is a nice stand of it in Durham along Rt 17. I love having this shrub in our gardens because it is a bee and butterfly magnet. I am pretty much guaranteed a good nature photograph if I walk over to it with my camera in hand. Last night I walked over to it and watched this Tiger Swallowtail nectar on it for a long time. 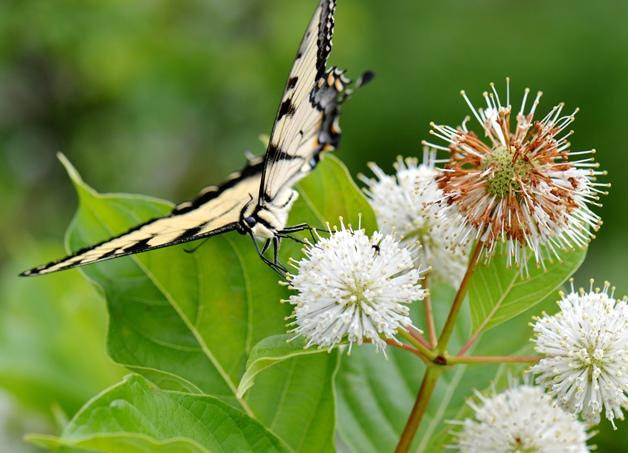 A tiger swallowtail butterfly on the buttonbush. Speaking of butterflies, Amber found our very first monarch caterpillar and our first monarch egg a few days ago! We keep looking for more, but have not found any yet. Hopefully we will start seeing more eggs soon since we are regularly seeing a female monarch flying in the gardens and we have loads of milkweed and other types of Asclepias growing. The monarch caterpillar crawls along the budded blossoms of a milkweed plant. 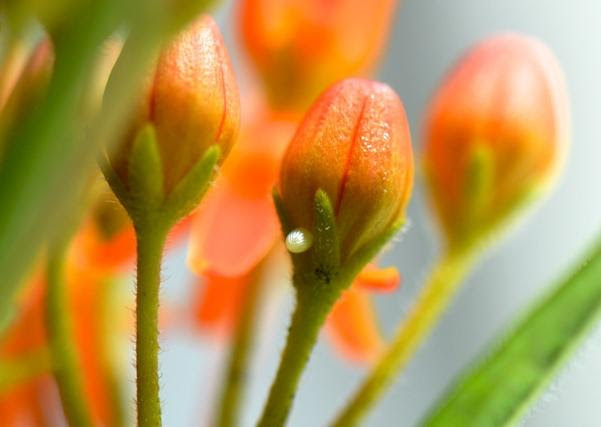 A tiny white monarch egg on Asclepias tuberosa. 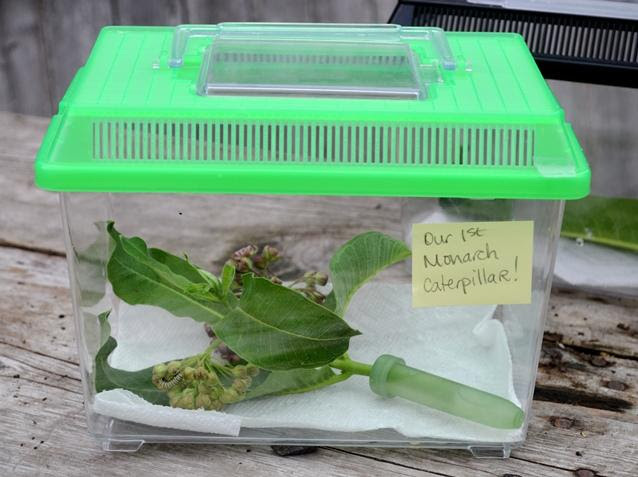 Did you know monarch caterpillars eat milkweed flower buds too? Many times the eggs are laid ON the buds so when the baby caterpillar hatches, it can crawl right inside the flower to eat and grow in a protected space. There are so many predators who hunt monarch caterpillars. Did you know only 2% of eggs laid actually survive to be a butterfly? This is one reason why we raise them in the store-to increase their chances of survival. 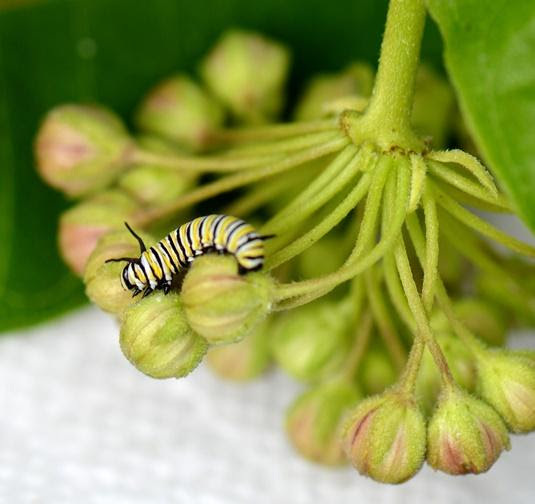 This year we hope you will be inspired to not only plant milkweed and other Asclepias plants in your garden, but try and raise a few inside and watch the life stages occur. We had so many requests for butterfly rearing cages, we now sell them in the store. 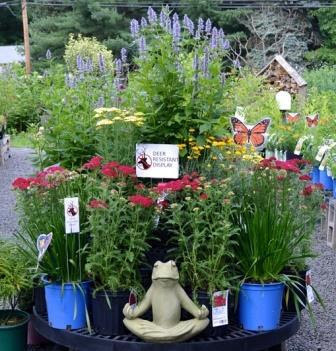 We cannot sell the caterpillars or eggs but we can sell you the many plants that will attract them to you for years to come! While the boss is away, we are busy with a few projects. A big one was the creation of our DEER RESISTANT plant displays. We have handouts on dealing with deer and plant lists for gardens that deer visit, but we have never had a concentrated display of actual plants that deer usually leave alone. 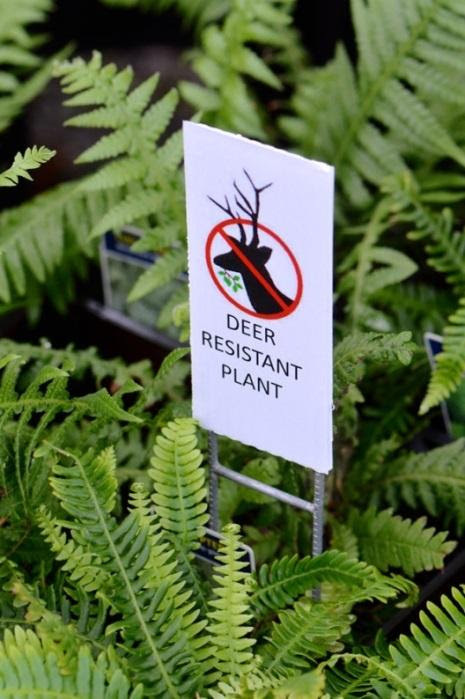 We rearranged the shade plant section and placed all the deer resistant plants in one area and labeled them with signs like this…. We also labeled many plants in our sunny sections with these signs. You can see a Vitex shrub growing in our demonstration garden. 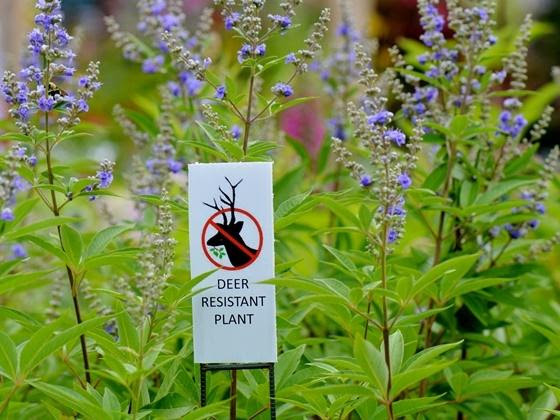 For a copy of our Deer Resistant plant list, click here. This Saturday, we are hosting a new event for us–Reading in the Garden. Join us at 9:30-10:30 for some herbal tea and a discussion of a few of our favorite books focused on gardening (or enjoyed while reading in the garden). Please bring a favorite book of yours and let us know what you like about it. It does not have to be a gardening book. Maybe it’s one that you enjoy reading while in the garden or one that brings back memories of your family’s garden. Sit back, relax and enjoy the company of other book lovers. Also on Saturday we are having an all-day book SWAP. Bring a pile of books you have finished with and pass them along to someone who can enjoy them too. Choose a book to bring home and read. At the end of the day, all books still here will be donated to the Edward Smith library right here in Northford. They are looking forward to our donation! I will be donating an old copy of “The Well-Tended Perennial Garden.” This is one of the best pruning books out there and we continue to sell it. Natureworks is a place for inspiration. We learned this week we are on an online list titled “13 Amazing Places In Connecticut That Are A Photo-Taking Paradise” from a new customer that came to visit. What a complement! We welcome you to take photographs of the flowers and our display gardens. To read about the other 12 places-click here and see how many you recognize.